I know it’s Saturday so I’ve edited the subject line. Sometimes I’m very good at getting Random Five on Friday up on a Friday but not this week. 2. (Yes I am cheating. I am going to count each thing as a separate item so I can get to 5!) I discovered that my favorite blogging editor LiveWriter will no longer publish posts to blogger/blogspot blogs because Google updated log in protocols. It’s a good thing that the protocols are updated to be more secure but it is a bad thing for me that Microsoft has not updated LiveWriter to include those protocols. It doesn’t look like like Microsoft will be updating LiveWriter. That stinks. 3. The dryer has decided to go on the fritz. It’s 17 years old. This isn’t the first time we’ve had issues and I am sure that Honeybear will be able to figure out the problem, order the right part, and fix the dryer. So what’s it doing? It stops. It will be drying just like it is supposed and then suddenly it stops. Turn it on and it goes for awhile and it stops. 11pm and it stopped and it would not start again. Next morning, it would work and then stop. So the dryer needs a babysitter to make sure it stays running. In the meantime my handy husband will do his homework and save the day! 4. The bathroom flooded. The toilet overflowed. 1:30 am (just two and half hours after the dryer quit), I wake up because I hear Turtlegirl, Tailorbear and Supergirl. I think Supergirl is bugging her sisters and I get up to shoo her back to bed with a reminder to leave her sisters alone. I find, however, Turtlegirl and Tailorbear with towels trying to clean up the bathroom. I am so proud of them for trying to solve it on their own. They were trying to not wake up mom and dad. I helped get the toilet so it wouldn't flood again and they cleaned up the floor. We all slept in the next morning! 5. 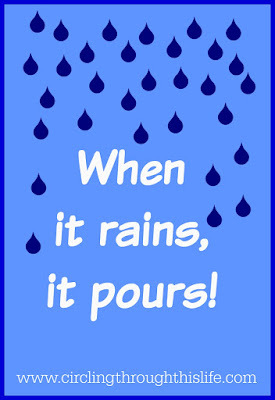 Sometimes the rain isn't bad things but blessings pouring down from God. I have experienced some blessings this week as well. Not going to share details but God used real human beings to demonstrate his love and care towards me and my family this week and I am grateful so grateful. It's been a week and these random thoughts center on Supergirl and Hypoplastic Left Heart Syndrome. 1. Supergirl had her routine follow up for neurology about two weeks ago. She's still being treated primarily for "partial seizure disorder." While we haven't witnessed an episode as severe as some we've seen in the past, we are still nowhere near the goal of seizure free for two years. We are still on anti-seizure meds and no changes in doses. At least not yet. 2. This week she had her regular follow up with her cardiologist. Glory to God for all things, she is still very stable cardiac wise. She's growing too. That's got to be in part to the meds her Endocrinologist has her on for thyroid. She's over 60 lbs. now and 4 feet tall. I am really hoping she can grow another 6-10 inches. Her genetics and her alphabet soup list of medical issues all contribute to being on the short side. We've always known this. It's still tough though when she says "I want to be as tall as you, mama!" 3. Doctors appointments and the month of May have sent Honeybear on a trip down Memory Lane. To quote Honeybear "too bad it became a stroll down Nightmare on Elm Street." At least the open heart surgery 15 years ago (the month of May) wasn't the "Nightmare" that the first two were. Not easy. Not without complications but oh so much better than the previous stages. 15 Years ago (May 2000) Supergirl had the 3rd Stage: Fontan surgery to complete the restructuring of her heart. 4. Did you know that Dr. William Norwood first started doing the first surgery of what would become the 3 staged Reconstruction Surgery for HLHS in 1979? Stage one is now known as the Norwood. It wasn’t until 1981 though that the first baby survived surgery. In the early 80’s only 1 baby out of 10 would survive. I spent some time googling and found the story of Jeni who was the first baby to survive from UCLA. She'll be 30 this year. She's married. I found her story to be very inspiring. It brought back scary memories but gives me hope for the future of my own HLHS baby. 5. HLHS is uncommon. It's rare enough to be listed in the database of rare diseases. It's also full of variants. Technically Supergirl is HLHS-Variant. Some of her issues are related to her 22q11.2 microdeletion like the aberrant right subclavian artery and her ventricular septal defect. Basically her heart is pretty messed up but thankfully she was still a candidate for the Reconstruction Surgery. A few years ago I had the opportunity to review a Once-A-Week Unit study from Homeschool Legacy. I used it with all four girls and we loved it so when I saw Homeschool Legacy on the upcoming vendor list I got very very excited. They offered several choices but I knew that Supergirl would enjoy diving into the Middle Ages with the Knights & Nobles the most so I begged for that one. You’ll want to be sure to check out all the Schoolhouse Review Crew posts to see all the different options we crew members had! The Once-a-Week Unit Studies are very flexible and at the same time very comprehensive so you can use them to supplement or enhance your current studies or use them as your main resource for history studies. I am using the Knights and Nobles study as our history program with Supergirl. There is plenty here to keep us busy beyond just four weeks! Knights & Nobles is a four week study with an optional fifth week for a medieval feast. Each of the four weeks has a specific focus: Castles, Kings and Queens, Knights, and Life on a Manor. The study guide begins with a page of reasons to use Once-a-Week studies followed by a table contents. There is a Getting the Most out of Your Study section at the end of the guide. This section contains information about how you can use the study to meet Boy Scout and American Heritage Girl badge requirements. You’ll also find tips and suggestions such as creating a lapbook and how to modify writing assignments for children of various ages. The assignments section begins with a list of Read Alouds for Non-Readers. Then it goes week by week. Each weekly focus begins with a list of Library Reading and Video Choices. Each book has the library call letters/numbers so that if you can’t find the exact title, you can substitute a book by the same topic. I had to do this for a few books and it was very helpful to know that I should be looking for books within a certain call number. Most of the video choices are for the Family Movie Night and are available on DVD from Netflix. At least one suggestion has a library call number. The assignment lists begins with the Daily Activities: The Weekly Focus Library Reading and the Family Read Aloud. The Once-a-Week activities are the bulk of the assignments. The first activity is the Family Devotional. Each Family Devotional ties into the weekly focus. For example you can read the Book of Ester (a queen) during the Kings and Queens focus week. Spend some time on the armor of God from Ephesians while studying about the Knights. These would be very easy to adapt to any denomination, or from a Catholic or Orthodox perspective. They rest of the activities are listed by subject or type and some have multiple options to choose from. There are activities that can be used for History, Language Arts, Music, Art, and more including Field Trip ideas! Although these are called Once-a-Week Unit Studies, students are not actually only doing history one day a week. Ms. Gibson includes a suggested schedule in the front part of the study guide. She lays out a plan that includes doing your regular daily studies 4 days a week along with doing your unit study reading and family read aloud each day. On one day of the week you would do the family devotional and your unit study activities. This is a guideline and she also gives suggestions for those who want to do a little bit each day instead of all the activities in one day. We choose to spread out the activities over the week instead of trying to do multiple activities in one day. It was far easier for me to spend two to three days a week doing activities with Supergirl. I did have to adapt some activities. For example, we couldn’t do the field trip for Biltmore Estates and I couldn’t find the recommended book, but I was able to find some virtual tours on line. I also choose to add some DVDs because Supergirl is not reading independently. We were able to find some DVDs to replace books that she couldn’t read to herself or that we couldn’t find that fit the topic. We also choose to make this more hands on for Supergirl by lapbooking our way through the study. She especially liked dictating to me to create mini-book about Queen Elizabeth. Some activities were able to do as written such as build a castle out of Legos. I do not consider myself a “unit studies mom” so I was very skeptical when I first reviewed Native America. Sharon Gibson’s Once-a-Week unit studies convinced me that I could do unit studies. Supergirl and I are loving Knights & Noble just as much as we loved Native Americans. I do disagree about the prep time. It takes time to hunt down the reading choices and to plan out how to do some of the activities and to gather materials. For me it is a jumping off point and is just what I need to put together a fun, but educational, study that my daughter will both enjoy doing and learn. If you like unit studies, you’ll love the Once-a-Week studies and if you are like me and not really sure about unit studies you’ll still love Knights & Nobles. Also Available: See the image for a sampling of the many different options! Or visit Homeschool Legacy to see all the available titles! NOTE: While the guides are written from an explicitly Protestant Christian worldview, they are not anti-Orthodox and the recommended books and dvds were from a neutral, secular point of view. The only overtly Christian aspect are the family devotions which I chose not to do. The family devotion activities, however, would be easy to modify to be from an Orthodox perspective. I think my Orthodox Home Schooling readers looking for a short unit study will want to check out these Once-A-Week Unit Studies from Homeschool Legacy. 1. This past Sunday was Mother's Day. I didn't make it to church but my daughters' brought home a rose corsage for me. It was beautiful. I also got to talk to my mom for quite a while on the phone. I miss her. 2. May is a time of remembering for me. Daddy's birthday was May 5th. His Daddy's birthday would be tomorrow May 16th and Grandma passed from this life to the next in May a few years ago. She was an amazing lady with a gift for story telling. I was missing her on Mother's Day and wanting to hear just one more story. 3. According to GoodReads I got behind on my Reading Challenge. It says “you are three books behind schedule.” Oops! I was ahead of schedule going into April and I was reading but I just never finished a book. Perhaps I was reading too many. 4. So speaking of reading books. I plan to finish Incriminating Evidence by Sheldon Siegel this weekend. I might even be able to finish another book or two. I just have to be disciplined and not start another book until I finish some of my “currently reading” books. 5. And still speaking of books, I don’t know if my love of reading came from my mother or from both of my grandmothers. I only know that I loved hearing Grandma Elsie tell her stories. She was a writer. She encouraged my love of poetry and stories. I have fond memories of going to the library and picking out books to read. Mom, Grandma W, my sister, and I off the to library. 1. It’s been a busy musical week for BooBear. Of course I don’t have pictures. That would mean that I actually was organized enough to make sure we had the camera and cornered her before she changed. On Tuesday she performed in the Keyboarding Student’s Recital. It’s called Keyboarding because it includes more than just the piano. This time it was about half piano and half organ. 2. BooBear performed yesterday as part of the Piano Ensemble. Earlier in the term her partner had to drop out so her partner was the director. There were 15 students involved. Most were duets but there was one quartet. I had never seen a piano quartet before. 4 students, 8 hands, two pianos and they played an arrangement of the Brandenburg Concerto. It looked so fun to play and it was so fun to listen and watch. I love the Brandenburg Concertos. 3. The last piece of the Piano Ensemble involved all 15 students. I am not sure how to do it justice in words. Two pianos with students coming and going. Most of the time there were 8 hands at the piano. For the final few measures they managed to get ALL FIFTEEN students arranged at the two pianos. It was quite a sight and very fun to watch. 4. Last week I mentioned that the rhododendrons were blooming. I even had pictures to include but I didn’t get them into the post. Oops. The pink flowers are nearly done but the red ones are in their full glory this week. These are pictures from last week. 5. 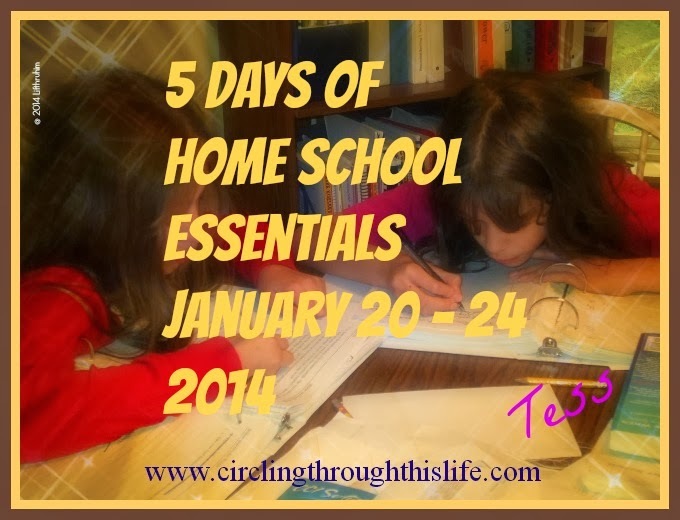 This has been a crazy week with real life interfering with our home school life. Add to the chaos that I am having a flare up of fatigue and pain and it’s been a long difficult week. I look forward to enjoying my Blue Sky [stevia sweetened] Creamy Root Beer and a snack and snuggling with my Honeybear while we watch some streaming on Netflix. As a home schooling parent I had heard the name Heidi St. John before but I wasn’t familiar with her or her materials. I’ve heard of lapbooking. I’ve even done some lapbooking with the girls though we never completed a lapbook “from scratch.” Supergirl loves lapbooking so I asked to review Lapbooking Made Simple by Heidi St. John and published by Real Life Press. At first, as I skimmed through this short eBook, I found myself thinking, yeah, yeah I know all that already. It’s not like we haven’t created lapbooks before, but in the past I had always purchased a pre-planned lapbook. When I slowed down to really read this little gem, I realized that I really could use help in creating our own lapbooks based on our current studies or interests. Sprinkled throughout the book are orange colored squares and rectangles with tips and suggestions. One of my favorites is found on page twelve in chapter three: Top Five Lapbooking Tips. She and I think alike because she suggested to keep completed mini-books in a zippered bag to keep safe until you put the lapbook together. We currently have a zippered bag going with the mini-books we are creating for our Knights and Nobles unit study for history. In my mind lapbooking has always been something that goes along with history or maybe science. All of the pre-planned packaged lapbooks we’ve used have tended towards, literature, history or science. When I read Chapter One, it’s like a light bulb went off in my head. Supergirl has some gaps in math and we’ve been working to close those gaps. She is learning some vocabulary for elementary geometry. I realized that creating a lapbook would help solidify those definitions and give her more practice with cutting and pasting. In Chapter Three Ms. St. John details out five steps to getting started. Step number four “Write out Ideas” has been my hang up in the past. With pre-planned or pre-packaged lapbooks, I don’t have to come up with the ideas of what to include. Ms. St. John writes that she and her family like to write ideas down on a white board. She also gave a sample of suggestions for a specific topic. When I broadened my thinking to include math concepts as a topic, I was able to brainstorm ideas for mini-books with Supergirl. Now that she knows we are going to be making more lapbooks, Supergirl is starting to come to me with ideas for lapbooks and mini-books. My preferred method for tracking these ideas is to use a free note app that syncs with my phone, Kindle, and PC. I can then have the Kindle or Phone at the table so I can reference the idea list when we are making mini-books or planning a lapbook. My favorite part of the book is on page six. She lays out the Golden Rule of Lapbooking “Your lapbook belongs to your child. Don’t take over and do it for him.” This has given me permission and freedom to let go of my perfectionist tendencies. While working on our Geometry notebook, I found myself saying “it’s your lapbook. You can put that anywhere you want.” I did help her by being her scribe and I did any cutting or trimming she needed but in essence it is Supergirl’s lapbook and she knows it. One last thing that I am taking away from this eBook is the idea that lapbooking isn’t just for younger students. My 17 year old high school student, Turtlegirl said “I loved lapbooking when I was younger.” I told her that she could still do lapbooks so she has decided that she will be creating a lapbook for her nutrition studies. It may end up being more of a hybrid cross between notebooking and lapbooking like described in chapter five but it will be her creation. This short simple eBook is a great overview and introduction to lapbooks and lapbooking. If you are new to homeschooling or new to lapbooking this book can get you started quickly. If you are like me and have some experience with lapbooking, mostly using the pre-bought kind with the templates and guides, this guide can take you to the next level and help you get started making lapbooks from scratch. Also Available: The Crew reviewed several products from Real Life Press. Be sure to click on the banner below to read reviews about all the different products. Grief is strange. It’s been just over 12 years since my father died. Some years, I make it through the anniversary of his death with little difficulty. Sometimes it hits me all over again that he’s gone and I grieve as if the wound was fresh and new. Same thing with his birthday which is today. I always think of him on his birthday. It’s a date engraved on my heart forever. May 5th ~ Daddy’s birthday. May 16th was Poppy’s birthday. I always wondered if Poppy thought of his son as an early birthday present. I am nearly certain that my father thought of his niece as his birthday present when she was born on his birthday. He could be such a difficult man to live with. I’m not sure how Mom managed it, but she did. They were married for 37 1/2 years before he died. Last month would have been their 50th wedding anniversary. I know Dad would have attempted some sort of huge party to honor Mom. They did have a big to do for their 17th anniversary. It was a big deal for my sister and I so we threw them a surprise party. We had some help from my grandma W and some help from a couple who were good friends with my parents. I can still see the look on Dad’s face. Shock, fear, amazement, and love. He came up the back step, saw the people in the house, turned around, walked away and then came back. Today he would have been 79 and if he was able, tomorrow he would start hinting that we need to throw him a party for his 80th birthday. He’d already have been bugging me about plans for mother’s birthday. She’ll turn 75 in January. Happy Birthday, Daddy. May your memory be eternal! A few years ago I had the opportunity to review the 1st Grade program from A+ Interactive Math with Supergirl. I know that she has learning gaps with her math skills and so I was intrigued by the idea of the Adaptive Placement Test and Individualized Lesson Plan that I could use with her. I chose to get the three student plan which allowed me to add both Turtlegirl and Tailorbear to my account along with Supergirl. What is the Adaptive Placement Test? The Adaptive Placement Test is a grade specific series of mini comprehensive unit tests covering a general concept area. For example, I assigned First Grade to Supergirl and her mini-tests included the concept areas: number sense, addition, subtraction, geometry, time, and money. I assigned both Tailorbear and Turtlegirl to the highest test currently available, Pre-Algebra. Tailorbear has been working through an Algebra program but I knew she struggled with fractions and scientific notation. Turtlegirl has been working through Geometry with her regular math program and will move onto Algebra 2. I wanted to use this program as a review to make it easier to move back to her Algebra 2 course that she set aside to complete Geometry. The Adaptive Placement Tests can be purchased alone or with the Individual Lesson Plan. Why is it called Adaptive Placement Test? The tests adapts to the students knowledge level. Each mini unit test will start with the first concept or sub-topic and as long as the student answers the questions correctly it will progress through all of the topics in that unit. If the student has difficulty and answers several questions in a row incorrectly, the test will end. If the student passes the test, the student can review the test but cannot take it again, and no lesson plans are generated for that concept. What is the Individual Lesson Plan? The Individualized Lesson Plan includes both the Multimedia Lessons with the Interactive Q&A and the online worksheets for practice. Lesson plans are only generated for units where the student did not score above the minimum passing score. If the student does not receive a passing score, and you have the individualized lesson plan, the program will add that concept with all of its topics to your student’s Lesson Plans. This means that even if the student correctly answered all of the questions from the beginning of the unit and only missed some at the end, those topical Multimedia lessons and online practice worksheets will still be available to the student. The plan is not as individualized as I expected. I thought it would only include the Multimedia lessons for the topics missed. This is not a problem though because even though the lessons are available to the student, she does not need to work through all of those lessons. She can work through the topics she struggled with and skip those that she has mastered. The Multimedia Lessons are the teaching component of the program. The Interactive Q & A portion can be used after watching the multimedia presentation or it can be used as a pre-test to gauge understanding of the topic. If the student misses the question, the program will automatically re-teach that topic. The student is encouraged to re-watch the presentation if she has any questions. If a student requires more practice or work with the topic, she can access the online worksheets. Solutions are available for the problems so that students can see what they got wrong and how the problem should have been worked. Tailorbear and Turtlegirl were independent with this program. They would take a test and if they passed they were done for the day. If they demonstrated gaps, they would begin working through the Multimedia Lessons with the Interactive Q & A. When ready, they would re-take the placement test. Supergirl is not ready for the same level of independence. I made sure that I was available to sit with her as worked through the placement tests and lessons. Sometimes we would choose a test and then spend several days working through the lesson plan. In theory we would work through the test and then the lessons and then re-take and then move on to the next test but our reality would depend on how much work was needed to close the gap. Sometimes we would take another test and then go back to the lessons. At this point she has completed all the placement tests but we still have a few concepts to work through and re-test. She very much enjoyed seeing her progress. She called the animated goal markers her “buddies”. I have chosen to not push with the addition and subtraction parts of the first grade program because I do not agree that borrowing and carrying are skills she needs at this time when we are still mastering the basic addition facts. We will continue to work on Geometry, Money, and Measurement. If there is still time left with our subscription we’ll try the 2nd grade level to see if I can gauge where she is at with 2nd grade math skills. I found myself with a love/hate relationship with the First Grade level Placement Tests. I loved that they did adapt to Supergirl’s ability and that if she got too many questions wrong the test would end sooner. If she kept getting them correct, it would keep going until all the topic questions were asked. I found it frustrating though because she had gaps within concepts. For example she “failed” the test for Time because she couldn’t answer how many days in week or how many months in a year. Because she did poorly on those early questions she never got to answer the questions about reading clocks. She can read both analog and digital clocks but didn’t get to answer those questions. I wish the program would allow the student to answer questions from all the topic areas in a unit, especially when the concepts do not depend on the previous topic as in the Time unit. Based on my experience, this is an advanced rigorous math program. If you have a student who is advanced in math or does very well with math, he may do well at grade level using the Family Math Package. It would be worth trying at grade level for the Advanced Placement Test but if your student does not do well at grade level, do try one grade level lower. If your student is average or on grade level in your current math program, please consider going one grade lower when choosing the Adaptive Placement Test. Overall, I love the idea of the Adaptive Placement Test and have found it to be useful to help me see specific content areas that I need to address with Supergirl. I did review the math program with Supergirl and I still maintain that this program as a primary math program is not the best fit for her but using the Adaptive Placement Test has worked well for her overall. It’s May, already? It’s the first day of May and it’s a Friday! Here’s Five Random Thoughts for this first Friday of the month. 1. Last week we had an interesting storm. It rains frequently here in the PNW but usually it is a constant drizzly kind of rain, but last week it was torrential downpours. It rained so hard that when I was in my room, it sounded like someone was taking a shower in the bathroom. I do not remember ever hearing the rain like that before. 2. The storm didn’t just have a torrential downpour though. It hailed as well. It hailed enough to make it look like a layer of snow on the trampoline. 3. Despite the rain that day, we’ve had some gorgeous days and the rhododendron bushes in my front yard are blooming. I love these bushes. I wish the blooms lasted longer. 4. This week I reviewed La La Logic Curriculum which is a brain training program based on the idea of brain plasticity research. The Brain Challenge mode uses activities modeled after childhood IQ tests. This program lays the foundation for learning. This program is now part of Supergirl’s day and I highly recommend it. Check out my review to learn more! 5. Speaking of reviews, I received the brand new, revised version of Teaching Writing Structure and Style from Institute for Excellence in Writing. I will be reviewing the Value package which includes the TWSS along with the Student Writing Intensive Level A that I’ll be using with Supergirl. She is so excited. She’s been watching the TWSS with me this week and on Monday we’ll start the SWI Level A. She’s the only one of four who has been excited about learning how to write.